Essilor Instruments International has just introduced NeKsia, a new edging solution that addresses eyecare professionals’ on-going need for efficiency, quality, and ease of use. Replacing the most widely used benchmark 3D edging systems of all time, the Kappa level edgers, NeKsia offers a truly next-generation solution, designed to achieve high performance, while incorporating one of the most user-friendly and productive processes in the world. 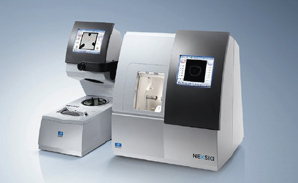 Rounding out the full range of Essilor’s system offerings, the new NeKsia combines high-precision edging and speed, along with modern, sought-after features such as extended tracing capabilities, accurate lens centering regardless of the lens power, touch screen technology, enhanced MMI, and powerful, optimized automatic and customizable edging cycles. Ideal for busy eyecare professionals looking for workflow optimization, this winning formula can keep up with the most demanding productivity and quality needs. This entry was posted in Technology by Envision Magazine. Bookmark the permalink.